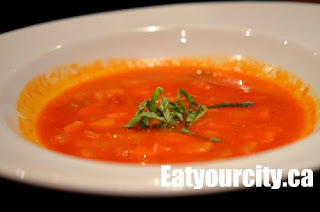 Eat Your City: Vero's Bistro Moderne Calgary - best $15 2 course gourmet lunch... yup, thats two courses for $15! Vero's Bistro Moderne Calgary - best $15 2 course gourmet lunch... yup, thats two courses for $15! With fond memories of a decadently done duck breast (seasoned asian bbq duck style but cooked to a tender medium rare) we had at Vero's last year, we were sorely disappointed it was no longer circulating on their menu when we dropped by for lunch. It was an excellently executed dish, and it was either removed because to stay competitive, most restaurants in Calgary update their menus at a dizzying rate, or it fell off the menu due to the economic times. 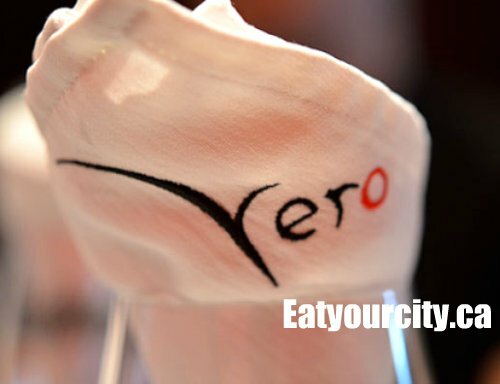 With a nod to said economic times and to encourage patrons to drop by for lunch, Vero's is running a lunch promo. Alongside some of the regular dishes you can order, a set menu lunch where you choose 2 courses off a limited menu is available for $15. Yup. $15 for an appetizer and entree, and if you have room, you can round it out with a dessert for another $5. So essentially, a 3 course meal for $20! I don't think many restaurants of Vero's calibre can boast a deal like this - I'm not too sure where they're making money on this either... but I digress, lets talk about the foooood! A few of us at our table chose to go with the set lunch menu, while others picked things off their regular lunch menu. On the set menu, we had our choice of prosciutto wrapped melon or soup of the day which turned out to be a tomato minestrone. Set menu entrees included a parmesana fish dish, a "Steak and Frites" and a chicken dish (I think - noone ordered it, so you can't blame my neurons). The prosciutto wrapped melon was a visually striking plate - the prosciutto was wrapped not around honeydew or cantaloupe, but a wedge of watermelon. 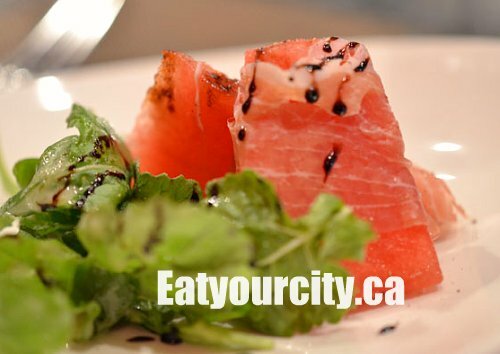 Though the watermelon wasn't too ripe, the watermelon and the syrupy balsamic vinegar drizzled overtop of everything still manages to overpower the subtle sweet-salty richness of the paper thin slice of prosciutto that held it in a loving embrace. The concept was a good idea, execution was pretty, but the flavors unfortunately didn't mesh the way a "traditional" prosciutto wrapped melon would. A fellow foodie reported the tomato minestrone was a nice thick, stick to your insides soup full of vegetables in a rich tomato base. Bits of tomatoes, carrots, and other diced vegetables simmered to soupy smooshiness peeked out of the thick (pureed?) tomato-y soup base. A small chiffonade of herbs made a simple and bright spot of color to contrast against the deeply rich red soup. It was also surprisingly quite filling, as the same fellow foodie was satisfied after finishing off his large bowl of soup. 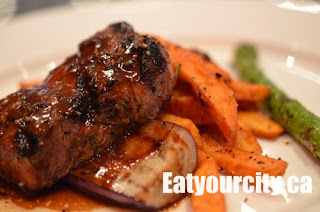 The "Steak and Frites" turned out to be a grilled spring creek organic flat iron steak (sirloin cut is my guess) with fingerling sweet potato fries and a pile of grilled vegetables. The steak was a fair 6oz size, seasoned beautifully and cooked to order with a slight smokiness from the flatiron. The sweet potato (yam - the fries were a uniform characteristic red-orange hue) fries were lightly battered, fried to perfection and served with a dusting of salt and smash of pepper - crispy on the outside, it yielded with a sweet smooshiness = Nom. The grilled veges were all executed well - the asparagus and zucchini were slowly grilled to impart a light smokiness and caramelized the natural sugars nicely. The Lobster Mac and Cheese (not on set menu) was a bit of a disappointment. There was a small amount of lobster meat.. about a small claw's worth that was mostly overcooked. 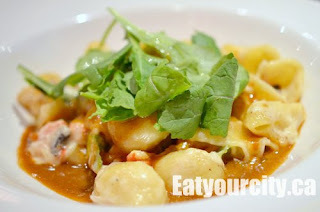 The large pasta shells was tossed in a creamy sauce redolent in seafoodiness, but lacking in cheese. Some at our table enjoyed it, others didn't. Mac and Cheese is one of those dishes where everyone has a different concept of what it "should" taste and look like. If you didn't tell me it was mac and cheese, I would have assumed it was a few bits of lobster and pasta tossed in a tasty if a bit shrimpy tasting carmelized bechamel (french for white sauce). The lunch dish was $20, for a bit of extra drizzled truffle oil in the dinner menu and probably a bit more lobster meat ($35), but if its executed the same way as the lunch dish, it certainly doesn't meet the standards of luxurious comfort food - you're better off choosing some of their better menu items - like the wonderful seafood platter. Okay, you need at least two people to have it but you can't go wrong with a huge platter of perfectly cooked and seasoned seafood. Mmmm. 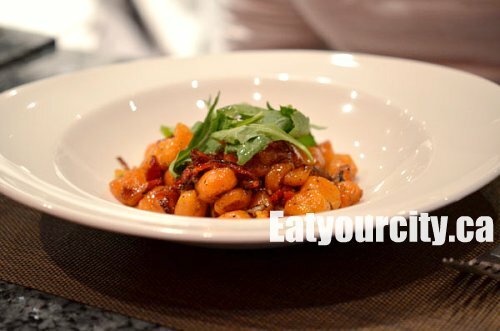 The sweet potato gnocchi with little pieces of chicken confit and sauteed sweet morel mushrooms, was finished with a bit of roast jus to add moisture and a touch of savouriness. All the pasta is made fresh in house daily, and the handmade gnocchi is no exception. The gnocchi are tender melt in your mouth morsels with the sweet potato adding in a nice light sweetness. The chicken and mushrooms added in a salty savory element with the roast jus tying everything nicely together. A delectable and comforting dish. Nom. We passed on dessert as we had our hearts set on the passionfruit creme brulee, paired with a passionfruit sorbet and lavender lemon cookie... because the server told us after we tried to order it that it was sold out. Ah well, we showed restraint even if it was after the fact lol! Overall, a great place for an exceedingly inexpensive lunch. Chef Jenny Chan is creative and melds various flavors into great tasty dishes. Quibbles included the lackluster lobster mac and cheese, and the prosciutto wrapped watermelon which just didn't work on the palate especially with the balsamic syrup on top. We'll keep our fingers crossed that Chef Jenny Chan will give the amazing duck a comeback round on her menu. But seriously, $15 for lunch? Get eating before its gone!